The self priming , magnetic drive pumps of the TMA serie are volumetric, can deliver the flow in both directions reversing the direction of rotation of the motor and are adequate to speedily prime chemical liquids with high specific gravity and/or high vapor tension. ( i.e. : H2SO4 98%, HCl 33%). Elk magnetic drive pumps are “hermetic” for the liquid pumped is totally restrained in the pump by mean of a single static sealing O ring interposed between of front and rear casings and no use of rotary sealing means (like fix and sliding rings of a mechanical seal ) is made. With GFR PP (Glass Fiber reinforced Polypropylene ) or CFF E-CTFE+C (Carbon fiber filled Etylene-ChloroTriFluoroEtylene) almost all chemical liquid can be pumped at either low or medium temperature. 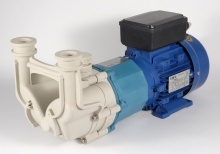 Thanks to its design this pump develops more suction lift in shorter time compared to traditional self priming pumps. The radial impeller, which operates perfectly in both senses of rotation, allows to invert the direction of the flow either lifting or pumping liquids like, for example, sulfuric 98%, hydrochloric 33% nitric , phosphoric, acid or sodium hypochlorite, ferric chlorite from as low as 4 m below of the suction of the pump. High torque coupling fitted with rare earth magnets ( Neodymium Iron Born ) allow to pump liquids as heavy as 1,8 kg/dm3 to the max. flow of the pump. Self primes from empty suction pipe. Standard IEC o NEMA motor.